Our Immigration Working Group formed in mid June to provide support for the Abolish ICE march lead by Congreso and People’s Assembly. Its current purpose is to develop our members’ capacity to support immigrant communities and stand in opposition to borders, police violence, and mass incarceration. At Immigration WG meetings, we focus on educating ourselves through a socialist framework, discussing different tactics of resistance, and how we can plug into active support roles. The next Immigration WG meeting will be Sunday, August 12th at 5:30 PM, 2022 St. Bernard Ave.
For this meeting, we will be discussing this short article: How the US’s Foreign Policy Created An Immigrant Refugee Crisis on its Own Southern Border. We’ll also discuss different tactics of resistance (i.e. 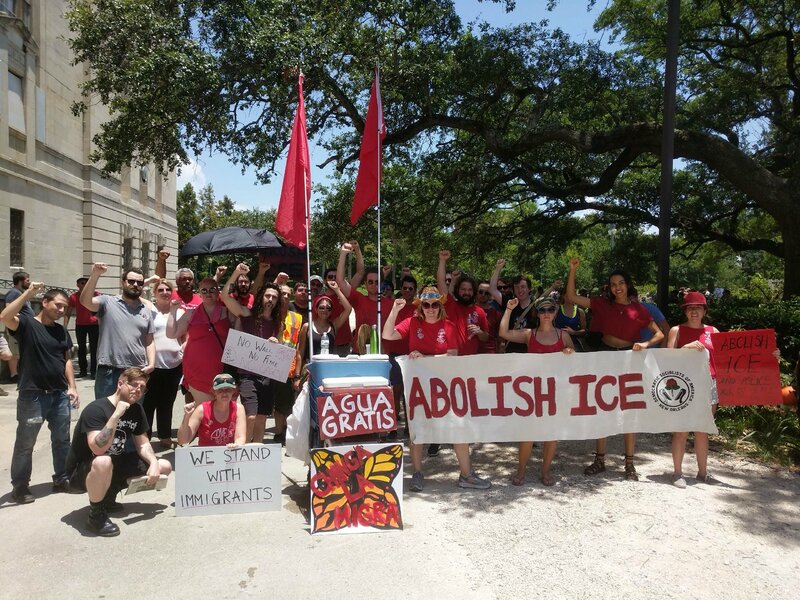 in opposition to ICE), and analyze what comrades in other cities have done. Additionally, we’ll go over different ways to plug into the community at this stage in our capacity. If there are any other specific topics, articles, or videos you’d like to discuss at this meeting or future meetings, let us know! This space is for us- to learn, to build capacity, and overall to find intentional ways to support our immigrant communities and work towards dismantling the security state, police violence, mass incarceration and imperialist military interventions.